Explore Iceland’s most popular route with your own private full-day tour of the Golden Circle. 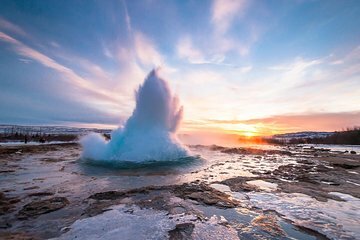 Venture out from Reykjavik to discover Thingvellir National Park, where you can see the European and North American tectonic plate rift, the Haukadalur Valley and its famous Stokkur geyser, the beautiful Gullfoss waterfall, and the Kerid crater. Spend the day learning about the history, culture, and geology of Iceland as you admire the rugged scenery.